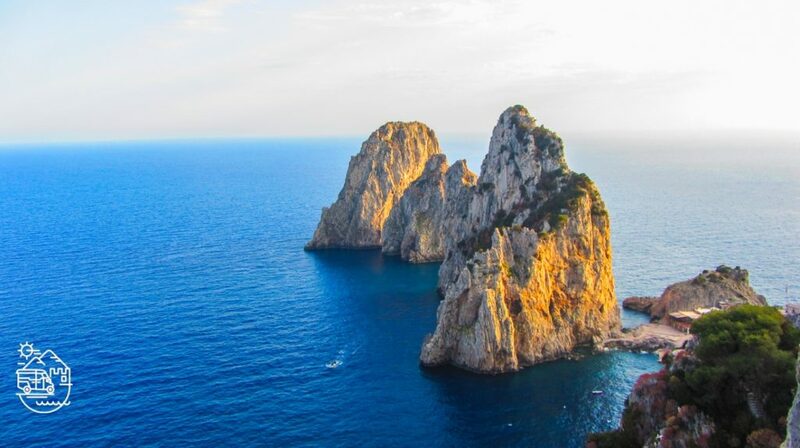 A full day tour to discover Capri by land and sea! An exciting experience including a boat trip around the island and time for sightseeing and shopping in the towns of Capri and Anacapri. The tour starts from the port of Marina Grande where we take the boat for the tour of the island. We pass Capri’s famous grottoes, the “Green Grotto” and the “Blue Grotto”, we pass under the arch of the “Faraglioni rocks” and we stop for swimming and sunbathing (note: the visit inside the Blue grotto requires an extra boat service once we reach the entrance to the grotto.. The visit inside the Blue grotto is subject to the time available and the weather conditions). After completing the full circuit of the island by boat, we get back to Marina Grande port to start the visit by land. By taxi, we reach Anacapri, the high town, where you can stroll in the town center for shopping, visit Alex Munthe’s villa “San Michele” or take the chairlift to reach Monte Solaro, the highest point in Capri. After a stop for lunch in Anacapri, we take our taxi back to Capri where we visit the famous “Piazzetta”, the shopping street “Via Camerelle”and the Garden of Augustus with stunning views to the “Faraglioni rocks” and “Via Krupp”.